O Lord, I cry out to you, “Come quickly.” Open your ears to me when I cry out to you. Let my prayer be accepted as sweet-smelling incense in your presence. O Lord, set a guard at my mouth. Keep watch over the door of my lips. Do not let me be persuaded to do anything evil or to become involved with wickedness, with people who are troublemakers. A righteous person may strike me or correct me out of kindness. It is like lotion for my head. My head will not refuse it, because my prayer is directed against evil deeds. When their judges are thrown off a cliff, they will listen to what I have to say. It will sound pleasant ⌊to them⌋. My eyes look to you, Lord Almighty. I have taken refuge in you. Do not leave me defenseless. Keep me away from the trap they set for me and from the traps set by troublemakers. David cries out to God with an appeal for God to "open" His ears and accept David's prayer, as a "sweet-smelling incense." He gives us a picture of the posture of his heart before God—with hands lifted up in surrender to God. He offers his prayer and himself to God as an evening sacrifice offered in the temple of God. David asks God to set a guard at his mouth and "keep watch over the door of my lips." David knew he needed God's help to keep him from being pulled into anything evil. David understood what Jesus said about the connection between the mouth and the heart—"For the mouth speaks from what fills the heart" (Matt 12:34 NET). Here David expresses his willingness to be corrected and taught what is right. He bows his head in humility and surrender to be corrected and taught as the Lord chooses. David's heart is surrendered to God in acknowledgment of his need and his openness to be corrected when he is wrong. This fourth and last stanza summarizes David's prayer. He seeks refuge in the Lord and looks to the Lord as if he's the personal servant of God. This great warrior-king of Israel shows his trusting dependence in the One he knows as the Lord over all. 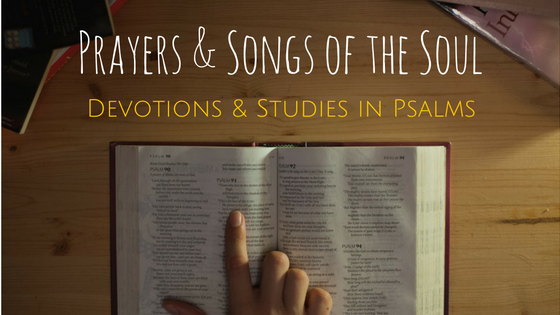 Are you able and willing to learn to humbly approach God in prayer as David did? God hears the cry of our hearts and mouths when we come to Him in genuine humility.